Blimey!! Now I Know Why We Have Loads Of Them!! Charles Schulz and his creative team must be applauded for this heartfelt conversation between Charlie Brown and Snoopy. Bird sent me this as her family is at the throes of deciding prolonging treatment of chemo and radiotherapy for her father at stage 4 terminal lung cancer. There is always the possibility of succumbing to the treatment instead of dying from cancer itself. It is difficult when there are relatives. She has to deal with both paternal and maternal side arguments. I told her to stay out of it as her mum is much alive and as his wife, she has to decide. Her family has decided to insulate her father from knowing about his condition. But her father, I am sure is an intelligent man, and will know from the treatment he receives. There is no best way to die really….her father’s mother (Bird’s grandmother) is still alive at almost 90 years old…- genetically her father might beat the odds! Tough decisions for Bird and all I can do is encourage her from afar. 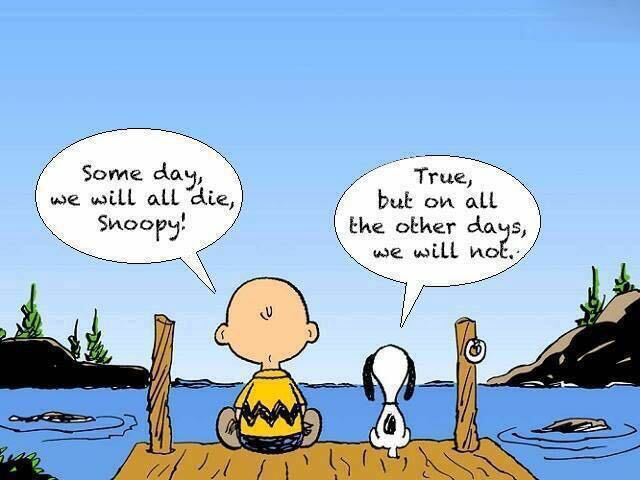 Stay strong Bird…..like what Charlie Brown and Snoopy says …we all gotta die someday but other days we will not. Blessings and a speedy recovery is wished for your father. A miracle if you will from above!! Kids Say It As They See It! New Age, New Media, New Way! These days it is Spam….named after my favorite tinned meat…. It seems the Land of Smiles, Thailand, has created a new toy rage! These are lapped up by ladies, complete with birth certificates and even having them blessed by Thai monks. Sounds scary….I half expected the Chucky horror kind!! Doll manufacturers prosper and monks prosper here. Cabbage Patch dolls were of the ancient times. They resembled child like characteristics and remotely resembled any child. It was clearly to me a play thing. They came with birth certificates too. But they looked hardly human and did not go through blessing rituals by monks! Thai Airways in trying to boost self out of low ticket sales jumped on the band wagon to indulge in the craze. They serve “lucky doll” meals and require “lucky doll” to be strapped in and before or after landing! This means the ladies have to buy their dolls a seat each on board each flight! Talk about desperate measures in desperate times! Loony adults…or adults with these lucky dolls lap it all up such that the airlines had to mandate all such lucky dolls must be scanned through airport security lest they are barred from boarding the flight! Why?! Cos the smart drug dealers found it a lovely idea to smuggle in contraband! As for me and my inanimate furball Garfield…..this is how we go through our flight! *Smiles at me as I put my back pack with inanimate furball and other stuff onto the plastic container into the scanner. *Smiles at me and nods her head – she must think I am a loon. She kindly lets me view. Indeed the outline of my furball is seen and he has nothing in the cavities. “Ahh…he is all safe and good to go. Thank you and have a fun work day “, I’d quip as I exit pass her point. She smiles again. Nice Aussie hospitality. After going through the scanner and lighting up like a Christmas tree, I furnished my implant cards so they do a manual hand held scanner on me. Cleared, I go on to pick up my furball in my back pack at the end of the conveyor belt. ME: “breathe….breathe….” as I quickly unzip the bag whilst seated in the holding area. I ain’t going to put my precious inanimate furball Garfield remotely near voodo good luck dolls with blessing ritual from monks! At least if it were pets as in live kitties or woofies….I can imagine them getting a blessing as it has a heart beat.